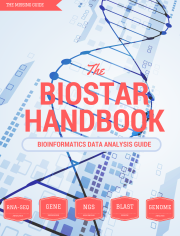 The Biostar Handbook introduces readers to bioinformatics, the scientific discipline at the intersection of biology, computer science, and statistical data analytics that is dedicated to the digital processing of genomic information. The Handbook has been developed, improved and refined over more than a half decade in a research university setting and is used in an accredited PhD level training program. The contents of this book have provided the analytical foundation to hundreds of students, many of whom have become full time bioinformaticians and work at the most innovative companies in the world. January 7th, 2019 the book includes a new, data analysis focused, beginner friendly bioinformatics course that follows along the second edition of the Biostar Handbook. Oct 1st, 2018 the book now includes a new bioinformatics course that provides easy to re-use solutions to a wide range of bioinformatics analyses. Readers may also access a new website to explore the recipe results in detail. June st, 2018 the Biostar Handbook includes a Python Course designed for life scientists. The course is an ongoing effort scheduled to be completed by the Summer of 2019. A structured path through the Biostar Handbook that covers the main topics of the field. Bioinformatics Data Analysis » A fresh take on bioinformatics education. Python Programming in 100 hours » How to use Python for bioinformatics data analytics. Learn Bioinformatics in 100 hours » An Effective Introduction to Bioinformatics Data Analysis. Enrollment in each course is included with the book. We use a Question/Answer based format to explain concepts and demonstrate methods in simple and practical manner. We found this to be the most efficient training method for the topics that we cover. We have been developing and teaching bioinformatics and programming courses to life scientists for many years now. We are also the developers and maintainers of Biostars: Bioinformatics Question and Answer website the leading resource for helping bioinformatics scientists with their data analysis questions. We built this book based on these multi year experiences in training students and interacting with scientists that needed help to complete their analyses. We are uniquely in tune with the challenges and complexities of applying bioinformatics methods to realistic problems and we've designed this book to help readers overcome these challenges and go further than they have ever imagined. It is not a what, it is a who. And it could be you. It is the person whose responsibilities go beyond well defined boundaries This book is for them. Visualization inspired by a blog post by Anthony Fejes: Who is a bioinformatician?